Delivery Time is an extension that supports for the checkout and delivery. With many outstanding features as setting the time, date for the delivery, and allowing leaving the comment when delivering, customers can easily setup the desired time which they want to receive the products. Also, thanks to these features, customers can know the day that the store doesn’t work and deliver the products. This extension will definitely bring many interesting benefits for store owners. Moreover, Delivery Time extension is totally compatible with our One Step Checkout extension. The customers can choose the day, time to receive the products and the related information to store owners as well as the shippers. Enable Delivery Time: Choose “Yes” so that customers can choose the time frame that they want to get the products. 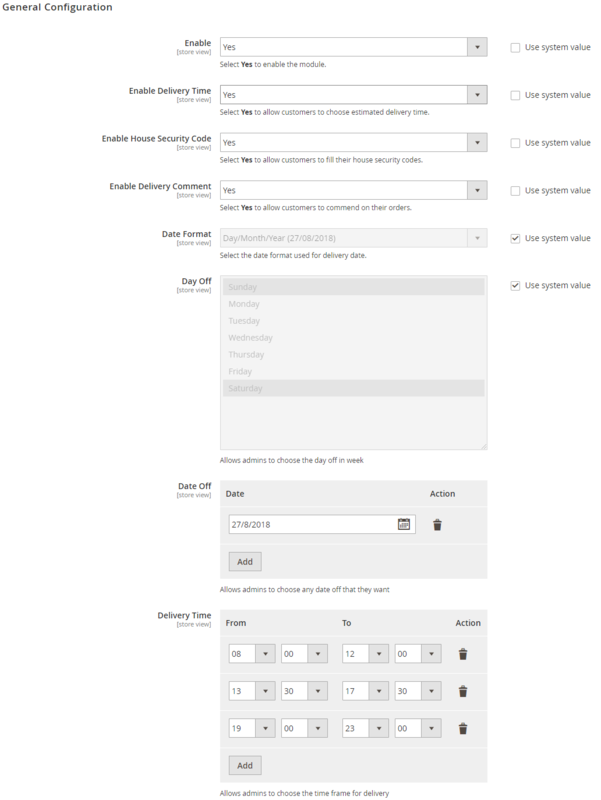 Admins need to set the time frame in the Delivery Time field. Enable House Security Code: Choose “Yes” if you want to display this field. Date Format: Choose an appropriate format for the date and time. We offer 12 availble formats. In the Days Off field: Choose day(s) not in your official working time. Date Off: Choose any date that admins don’t want to deliver. Delivery Time: Set the time frame to delivery during the day.